Hummingbirds! Part 1 /Hawks Aloft Inc.
Summertime in New Mexico feels like it isn’t quite real until the hummingbirds appear—these tiny, jewel-bright creatures that grace us with their presence for a few seconds before zooming away. There are many ways you can be hospitable to these birds and encourage them to frequent your yard all summer! 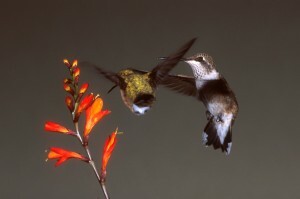 The best way you can help out hummingbirds is by feeding them with nectar. It’s quite simple: start with a ratio of 1 part white sugar to 4 parts water. 1:3 sugar to water ratio is also an option, if you prefer a sweeter syrup. Boiling this mixture for cleanliness isn’t required, though the water needs to be heated enough to dissolve the sugar. Clean your feeder with hot water (no soap) once a week or so, and replace the water if it looks cloudy as that’s a sign of spoilage. Most importantly, don’t add anything else, especially not red dyes, because these can be harmful to the hummers’ sensitive bodies. The red coloration on the feeders will be attractive enough to these birds. Hang the feeder in an unobstructed area, and watch as your yard fills with beautiful hummingbirds! 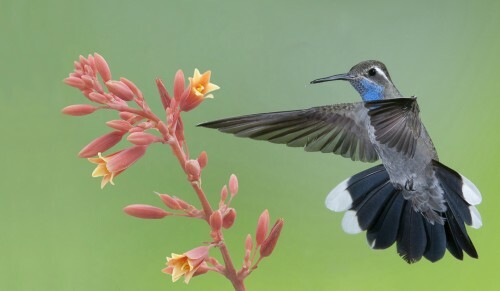 Of course, you can also add flying and rooted beauty to your yard by planting a hummingbird garden: a variety of flowering plants that are particularly attractive to these birds. 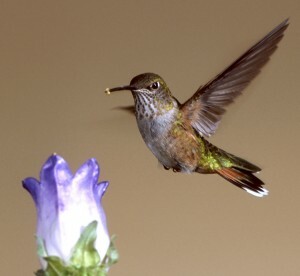 The Hummingbird Society has a list of eighteen suggested plants that will not only provide nectar but also perches and, in the case of Desert Willow and larger plants, shelter and nest-building sites. This is the nesting season for many birds, including hummers, and as such it is especially important to provide them a little extra help in these months. Males have very little purpose during nesting except to spread their sperm as far and wide as possible. They do not help the female at all with incubation or raising the chicks. Females build the nest alone. In it she includes a large ball of spider silk, which serves to keep the eggs and later the chicks snug and secure inside the nest, stretching as they grow. One female will usually raise two chicks in a breeding season. Rufous Hummingbirds, a fairly common species here in Albuquerque, will actually stay in their northwestern nesting territories until they are done breeding, around July 4. After that, the males migrate down here to breed with more females—again, these birds are on a serious mission! In the next blog post, I’ll talk about how to identify some of the more typical species spotted here in Albuquerque. Until then, enjoy these beautiful birds when you see them! Thanks for this article and the great photos! 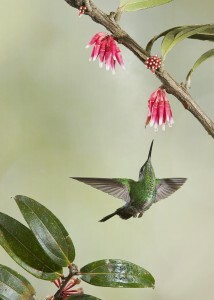 I know how hard it can be to photograph hummingbirds! Glad you enjoyed the post, DeAnna! Our photographers are pretty fantastic at what they do! I live in a suburb of Albuquerque, NM. We normally have many humminbirds including at least five different kinds come to our feeders. This year there has been a single bird. It has not fed at our feeders, no at the flowering vines on the back fence. Can anyone tell me what has happened to the birds? Robert, I think I have the answer to your question: Your birds are in Taos! This morning when I went out to check the feeder, there were 9 hummingbirds squabbling over it. And it was nearly empty after I had filled it to the brim yesterday. Could it be that the warmer weather is forcing them to move north. At any rate I will try to encourage some of them to move south. They’re eating me out of house and home!